Wales boss Warren Gatland is hoping his side can avoid 'second season syndrome' as they prepare to defend their Six Nations crown. Gatland's side enter this year's Championship in the unfamiliar role of favourites following their Grand Slam campaign last year and some strong performances in the autumn including a victory over Australia. However, he is wary of the pressure that expectancy brings and is determined to ensure it does not have a detrimental effect on their chances. Together with his assistants Shaun Edwards and Rob Howley he is hoping to combat so-called 'second season syndrome'. Edwards won numerous honours as a rugby league star with Wigan, while alongside (rugby director) Gatland and (scrum-half) Howley, he enjoyed European and domestic success in his current Wasps coaching role. "Shaun spoke to the players on Tuesday about his experiences of the past, coming from champion Wigan sides and how they responded the following year, and the experiences we had at Wasps," said Gatland. "It's not the external pressures, it is the internal pressures you put on yourself in terms of wanting to perform. "The last thing we want to do is let ourselves down and let the public down by having a really poor Six Nations. It's all very well being Six Nations champions, and I am not saying we are going to repeat that, but we want to continue to improve the team and compete with the best sides. "We know the (Welsh) nation expects, but we will not be complacent, we will be on our guard. Teams have gone to Scotland in the past and been over-confident and expected a result, but the Scots will be looking forward to taking us on. "If we take the challenge lightly, we will be playing straight into their hands. They are a much-improved outfit over the last 12 months, and they have the talent and the ability to turn teams over." Gatland, not for the first time this season, is sweating on centre Gavin Henson's fitness. Ospreys star Henson, poised for a first Test match appearance since last year's Grand Slam-clinching victory over France, has handed the Wales camp a major injury scare. The 27-year-old suffered tightening of a calf muscle in training on Tuesday, and he did not train yesterday. Henson has missed Wales' last six Tests, initially because of an ankle injury and then a long-standing Achilles' tendon problem he aggravated before the autumn series opener against South Africa. 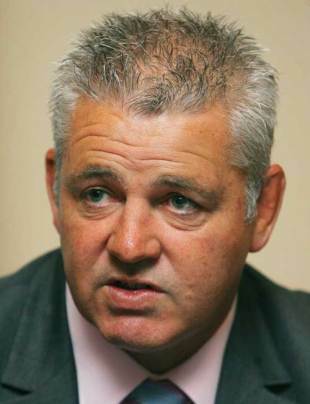 Gatland added: "When he comes in on Friday we will make a decision. We are not going to wait like we did in the autumn until the day of the match. It's only fair, in the first game, we make the call on Friday. "If Gavin is not right, Tom (Shanklin) will come in and probably go to 13, Jamie (Roberts) move to 12 and Andrew Bishop brought in as bench cover." Henson's scheduled return is one of three changes from the side that beat Australia 21-18 just under 10 weeks ago. He replaces Shanklin, with Roberts moving to outside centre, while 20-year-old Cardiff Blues wing Leigh Halfpenny makes his Six Nations debut and Ospreys scrum-half Mike Phillips returns after recovering from a major knee injury that required two operations.